You want numbers? Have some numbers!! On this page you'll find some data that goes right back to December 2005 on the price of the Paint Brush. It isn't terribly detailed, but you might see some trends that have stretched back for years. The sheer magnitude of paint brush inflation was what had struck me about these graphs. Perhaps this petpage could be a wake-up call for TNT up there, trying so hard as they are to control inflation, to make painted goals more achievable for all players? All I can say is to wish them luck. Disclaimer: Like most things in life, this data has its limitations. Importantly, note that I did not gather data for paint brush prices in 2006. The points on the graph where 2006 should be are just estimates based on the average between 2005 and 2007. Also, let the record state that in 2005 I was still a bit of a noob, and I wasn't recording paint brush prices down with the same purpose I have in mind today. I was just drawing up a list of prices in order to work out which PBs gave the best bang for their buck :P It shouldn't affect the data too much, but just bear that in mind. The prices of PBs are somewhat subjective, anyway, since most of them have to be found on the TP and not everyone on the TP lists prices. I record these prices as if I am about to buy the paint brush, so normally I'll be looking for the cheapest price represented by the lowest cluster of prices. This usually means I'll be taking the lowest price on the TP unless it appears to be an outlier, and in that case I'll take the second lowest. Prices were recorded in December, so keep in mind the little bit of Christmas inflation that happens. Check the data table below to see precisely when during the year these prices were recorded. Final disclaimer: please do not steal my data. I took the time to record all this and it's my decision to even put it on a petpage for you all to see. Link back here if you want to share these results with other people! The most telling trend for this year is that the prices of many of the most expensive Paint Brushes have actually dropped. Significantly, too! Just look at the way those lines at the top were leading upwards for years, only to take a drastic tumble this year. In past years, these high-end Paint Brushes were the fastest growing in price, and I had commented on how I thought that any paint brush over the price of 1 million was dead-set to keep inflating. But this year we've found something completely unexpected. 5 out of last year's top 6 most expensive paint brushes have dropped in price. And that's not something to sneeze at. Quantifying how fast a PB is growing relative to its price last year. In this section I compare the prices this year to those last year, in order to calculate how rapidly these paint brushes are growing at this point in time. First, I find the difference in price between what it was Dec 2010 and what it was Dec 2009. Then I divide that difference by the PB's original price in 2009. Finally, I multiply this number by 100 to create a percentage. An archive of what was on this page before. Notice that no Paint Brush worth over a million neopoints has ever decreased in value on this graph. Roughly, the more expensive the PB, the greater the rate of inflation. Not all paintbrushes have increased in value. Some have even dropped in price! Take for example the camouflage paint brush, which was newly released and going for about 800K around the time I took the data in Dec 2005; by Dec 2008 it had joined the ranks of checkered and striped at around 200K. This is probably because when it was first released, there weren't very many in the economy yet, and gradually over the years the supply of this PB grew larger while hype over it being a new colour faded away. Personally I don't expect it to drop much more after this, unless Tarla is involved. And to put things in perspective, let's try comparing this inflation to the "official" inflation rate in Neopian shops (not user-owned shops), which on December 12 2008 was at 2.31% per year. If all the paintbrushes since 2005 had inflated at the same rate as the stuff that stocks in official Neopian shops, we'd get a very very different graph, to say the least :P And Pirate Paint Brushes would sell for 2.8 mil, not 7. My previous assumption is still holding true - no Paint Brush over a million neopoints in value has ever decreased overall. However, as of December 2009, there are now more buyable Paint Brushes than have EVER been recorded on this graph before. In 2005, there were seven PBs under 100K; that rose to eleven in 2008, but at the end of 2009, there were a whopping sixteen. Here's a closer look at what's happened to the PBs currently floating on the cheapest end of the spectrum. Of the Paint Brushes that are under 200K at the moment, it a appears that many have been deflating for some time. Perhaps the most dramatic falls in price have been caused by Tarla - for example, cloud has been given away on several occasions this year. 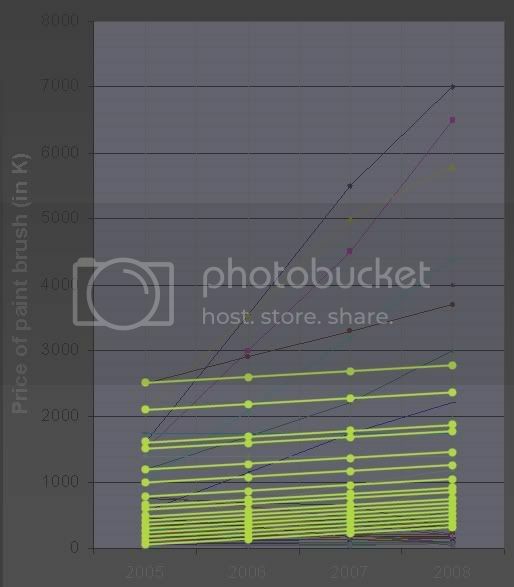 However, this graph is a little misleading, as it is quite selective in showing mostly the paint brushes that have had some sort of catastrophic fall in price. With this graph you can see a more balanced picture of how the lower-end PBs have taken many different directions in their pricing. I think as a natural consequence of the nature of customisation and the urge to double-paint, simple colours like white, spotted, shadow and brown are getting more expensive. And finally, here's a graph that's basically the opposite of the second graph on this page. It tracks how the cheap paint brushes of 2005 worth 200K or less have fared over the years. Some have risen steeply, others have fallen, most have sort of lingered around the same price, give or take a few K.
So, for the most part, my feelings about this data remain the same, Tarla notwithstanding. The more expensive a Paint Brush is, the greater its rate of inflation. On the higher extreme, the Pirate Paint Brush has been rising by well over a million, sometimes two million each year. The thing with Tarla's giveaway is that, while it does deflate the cheaper Paint Brushes, it actually contributes to the inflation of the more expensive PBs, since Paint Brushes are themselves used to trade for other PBs, and an overabundance of smaller ones will lead to a rise in price for the greater ones to compensate. A true solution to inflation will probably take a lot more careful working out on TNT's part, but I do commend them for trying. It's a little hard to make out some of the values on the graph above, so here's a table of all the numbers I punched in. Do not steal my data! In 2007, 2008 and 2009, data was taken on December 10. The precise date in December for the 2005 data is unknown, but I do know that it was after the "Wocky - Snow Day" avatar was released, which was Dec 12, and before Christmas. The Christmas PB deflated massively on December 25 2007 (advent calendar :P), but the 2007 data was taken on Dec 10 so it missed that. Likewise it deflated again on Dec 6 2008, this time just before data was taken for the year. By the year 2010 the Lutari Paint Brush had existed for a couple years already, but I only just remembered it could actually be bought and sold. Sorry I didn't take data from the earlier years. All data collected by me, Pacmanite. Formatting of the graph to look kind of tacky = by me, Pacmanite.